“The Critic” started with a simple concept: a disgruntled young boy standing in front of an abstract painting he neither liked nor understood. This idea turned into something that took on greater meaning for me as an artist. The image of my youngest son at 6 years old in his button-down shirt and clip-on tie represents to me the illusion of authority that our critics (both personal and professional) possess. His sour expression reflects the critic’s condescension and his dissatisfaction with the art that surrounds him. I wanted to explore the question, “What is art?” To some people, the image of my son is the art. To others, it is the abstract composition behind him. The waves of critical preference over the last 150 years may affect our preference for the realistic or abstract. I wanted to combine two styles of artistic expression. I also wanted to use vibrant color. After months of working in a dark, muted palette, I wanted to create something visually exciting. Composing the background was more daunting and challenging than the subject. To be honest, I didn’t know the first thing about creating a piece of abstract art. It’s funny how we can look at things and say, “Oh, that is easy,” until we actually have to do it. Going back to what I learned about design, and deriving inspiration from some more adept abstract artists, I created the background with a cruciform design using images that I found common in abstract paintings, circles and lines. I had an advantage in this task because I have always used acrylics in my paintings, and their quick drying time allowed me to easily change my mind about the design and composition. 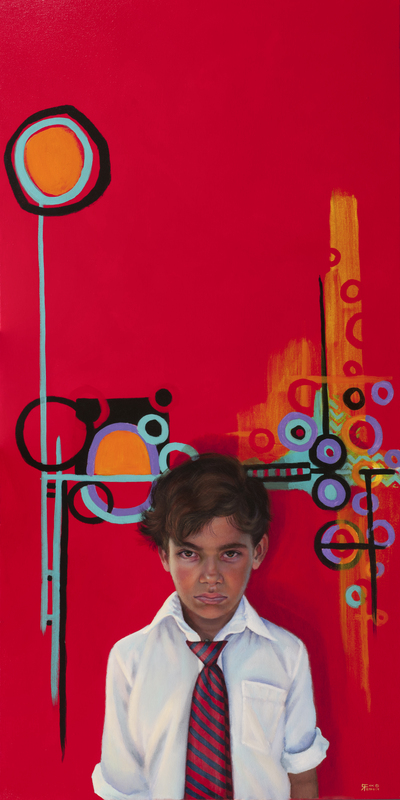 Although I wanted the boy to be the focal point of the painting, I needed the abstract piece to catch the observer’s eye. “The Critic” was inspired after my yearly trip to the Los Angeles Art Show. 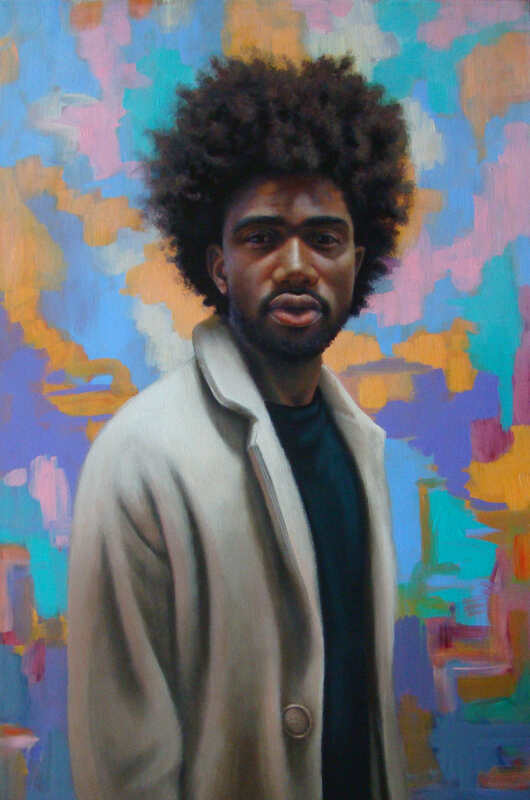 I saw a man standing in front of a large abstract painting and loved the contrast of his dark skin against the pastel colors of the abstract. We spoke and he agreed to let me photograph and paint him in the setting. Even though I was happy with the finished painting, I wanted to explore the juxtaposition of representation and abstraction further and the various opinions and schools of thought on them both. I also wanted to address the fact that everyone is a critic. The educated and the layman all have their opinion about art. I’ve done a couple of paintings that explore graffiti art instead of the abstract. The first painting, “The Artist,” is of my daughter, who is an illustrator and a tattoo apprentice. 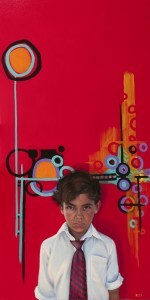 The second painting, “Street,” is of my son (the same boy as “The Critic” only ten years later). I did “The Critic” only a year ago, but it was based on a painting I did of him when he was little. I get bored easily, so I am constantly switching back and forth with ideas. I plan on doing some more of the abstract realism theme, just not right at this moment. Things slow down for me usually this time of year as I start teaching again. I teach at Los Angeles Academy of Figurative Art and lecture at the Golden Artist Colors Company. I have a lot of friends who do both art forms, so I try to appreciate them all. I think it is important, as an artist, to learn to appreciate all forms of art. I had a friend, a 90-year-old World War II pilot, who was an animator at Disney. Back when I just started painting I belonged to an art association where I met him. I remember someone doing a demo one night. The work was abstract, and the person demonstrating seemed to just be throwing paint around with no real rhyme or reason. I turned to my friend and said, “Are you getting anything out of this?” He said, “I try to get something out of everything.” Those were really wise words. I was humbled and felt ashamed at my “I’m better than that” attitude. I’ve tried to apply that same perspective to the last 20 years of my life. I try to get something out of everything, even though I might not necessarily understand it. There is something to be learned from all forms of art. I think when people hear the word “graffiti” they think mainly of the text version of that form of street art. But I think the terms graffiti, mural, and street art are almost interchangeable now. I was at Art Basel in Miami a few years ago and the streets of Wynwood were just incredible. The murals and graffiti art that covered every building in the area were just amazing. It’s hard that most people don’t know the names of these artists, but I think they are finally getting some well-deserved recognition. I saw a great documentary on the exhibition “Vitality and Verve: Transforming the Urban Landscape” that was held at the Long Beach Museum of Art in 2015. The paintings that were created for this event were exceptional. Some of the artists that stood out to me were Greg Simkins (Craola), Esao Andrews, Jeff Soto, and Aaron Horkey. I also like Banksy, Basquiet, and Fairey, each for different reasons. Greg Simkins’ work is influenced by his illustration background, and as I said before, I have always loved illustration. His intricate designs and character development weave into these giant stories that he portrays on his walls and canvases. I think Banksy has brought attention to social and political issues with his art. His anonymity and stealth has added a sense of mystery and surprise. I guess this is the same with Fairey. He rose to fame with a few stencils that got people wondering who he was. Of course, his controversial Obama portrait made him really famous. I think Basquiat was a ground-breaker as one of the first graffiti artists to move from the streets to the museums. Esao Andrews’ work, although also illustrative, has a more surrealist quality to it. He stretches recognizable proportion and form to create his narrative. His work evokes a sense of mystery to me. Jeff Soto creates unique characters using a vivid eye-catching palette. His work looks like something that has come out of a science fiction novel. Aaron Horkey, a poster designer, uses intricate line work and dynamic compositions. When it comes to representational art, I love all the artists we consider masters, including Sargent, Zorn, Alma Tedema, and Gerome. I also love those who are considered illustrators, like Wyeth, Rockwell, Maxfield Parrish, and Carl Larsson. 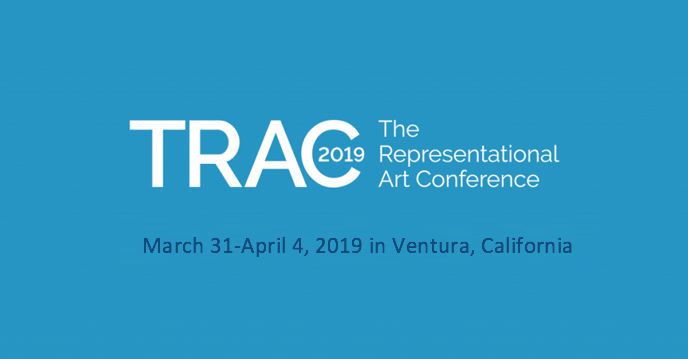 Despite this, I think I am more influenced and inspired by my contemporaries, such as Cesar Santos, Andrea Kowch, Jeremy Lipking, Joseph Todorovich, Brad Kunkle, and Katie O’Hagan. They are incredible craftsmen painting contemporary subjects. I love the way Cesar Santos takes his incredible technique and style and incorporates other elements into his work. His large abstract brushstrokes mixed with his highly rendered portraits break the barrier between the two. 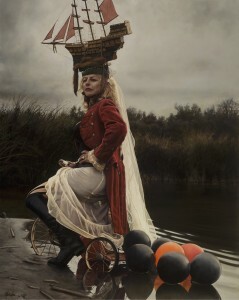 When it comes to Andrea Kowch, I love the illustrative and surrealist qualities in her work. When I see her and Pamela Wilson’s paintings, I just scratch my head and wonder how the heck they come up with these brilliant ideas. I studied briefly with Jeremy Lipking and I have never seen anyone paint like him. He makes it seem so effortless. I first saw his work at Bergamot Station probably 10 years ago. I was blown away. Here was a guy in his late twenties who was painting these beautiful works that were better than things I had seen in museums. Some of his latest more Western-themed art is his best. His art is incredibly beautiful and touching. I think what it boils down to is the appreciation of any artist that displays great skill and mastery in whatever medium or genre they work in. I think that’s what all these artists have in common. I don’t have a studio; I paint on the island in between my den, kitchen and dining room. With six people in a three-bedroom house, free space is very limited. The one good thing about painting in the hub of the house is that my art is always visible. This really helps me scrutinize my work from every angle. I have created my own methods and techniques because I work in acrylic. Representational painters who work in acrylic are few and far between, and I think all of us have had to create our own methods to get the results we are looking for. All my sensibilities lie with traditional art, however, oil painting techniques do not translate well into acrylic because you lack the blending time that you have with oil paint. In my method, I use alternating opaque and transparent layers of paint to give the illusion of color blending without that necessarily being a reality. It is an indirect painting method that uses a lot of scumbling and glazing. I don’t use any mediums, only paint and water. As for brushes, I use synthetic like Golden Talkon. Something with some spring and substance. Natural hair brushes are too delicate, and bristle brushes tend to remove paint from underlying layers with my scrubbing type of application. After more than 20 years of painting with them, however, I can’t imagine using anything else. I can correct errors in minutes and finish a painting and varnish it the next day. I love the immediacy of the product. Everyone who sees my work in person thinks that it is oil and I love telling them that it is actually acrylic. So many people only associate acrylic paint with abstract painters. I work for the Golden Paint Company as one of their working artists and I love being one of the few fine artists in that group. I love to go to art schools and universities to educate artists about this relatively modern medium.